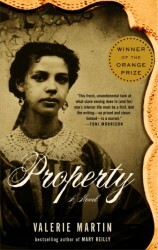 Set in the surreal heat of the antebellum south during a slave rebellion, Property takes the form of a dramatic monologue, bringing to the page a voice rarely heard in American fiction: the voice of a woman slaveholder. Manon Gaudet is pretty and petulant, self-absorbed and bored. She has come to a sugar plantation west of New Orleans as a bride, bringing with her a prized piece of property, the young slave Sarah, only to see Sarah become her husband’s mistress and bear his child. As the whispers of a slave rebellion grow louder and more threatening, Manon speaks to us of her past and her present, her longings and dreams in an uncensored, nerve-wracked, and perverse confession direct from the heart of moral darkness.